Which are the most popular search engines I should target in each country? Its not often I look at trends data but its good to do every quarter. The popularity of search engines does change and within this blended search like video, images, local search is becoming more important. My comments below focus on how this data has search implications but the links also show popular social networks & entertainment sites. This data is always useful when justifying time & effort for channels or campaigns. Another tool not mentioned below is Google's Adplanner (& its top 1000 sites report), this is a great tool when you need data / demographics on categories or specific websites. 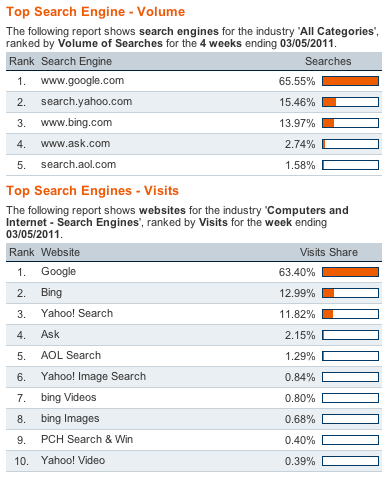 May 2011 update - Another Hitwise update on search engine use. This update on search engine and social media popularity shows that Google still accounts for 90% of searches - the key figure - many uses visits across all Microsoft sites which is misleading. I'm often asked whether a focus on Bing is worthwhile. This suggests not unless you are a large brand tapping into demand of many consumers for a mass market product. A search specialist at a phone retailer also mentioned to me that it's worthwhile for brand and brand mispellings since many still use Internet Explorer which is powered by Bing by Default. Data updated monthly from Data Centre. Hitwise have some useful free data on their "Data Centers" pages which can be useful if you get questions from colleagues like "Should we be doing more on Bing?". So what do the latest stats show us? 1. 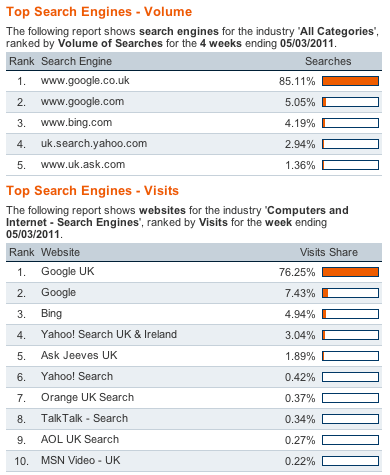 Google.co.uk dominates in the UK, so search marketing activities must focus here. YouTube is also in most reports on the hitwise report though not counted as a search engine, a large audience to target though! 3. The US has more Bing+Yahoo! users, roughly 30% of the market share, definitely worth understanding demographic & audience differences if the US is a big market for your business! Of particular interest for marketers responsible for international marketing, there is a report from WebCertain helps puts some key data surrounding the use of search & social networks for multiple countries at your fingertips. Covering 21 countries this report is a great read for some small insights into how the web is used differently in various countries across the globe. 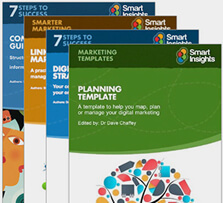 For companies operating in multiple countries this report may help you understand why replicating what you do in the UK is not always the best solution overseas. For example did you know that Brazil is leading social networking with over 86% of Internet users, using social networks. This is clearly a huge number, and you will not find them on Facebook but instead Google owned Orkut!